Our family of 9 does a group themed costume every year as our Halloween tradition. We come up with ideas as a family, taking input from all 7 of our children. Since we make our own costumes, we also take into consideration the feasibility and financial aspects involved. The most difficult part is picking a theme with enough characters. Then we vote. We try to pick our costumes based on what will be fun and make people smile and apply to kids of all ages. This year, we chose the classic "Peter Pan" ensemble. Since the majority of our costumes and props are homemade, we try to use things we already have at home. We will use old costumes, clothes and whatever our imagination can create. Since we make such a big costume, we often hit thrift shops. We find a lot of items to repurpose or often buy items just for the fabric. What was originally a women's overcoat, after a lot of cutting and some added details became the coat for "Captain Hook". The costume for "Pan" was a tablecloth, "Tinkerbell" and "Wendy" both from bed sheets, and "Tiger Lily" a couch cover, all from thrift stores. Our props are made from spare things around the house. PVC pipe was used to make our own umbrella for "John Darling". We used a torch to heat and bend the pipe, added caps and spray painted, and then hot glued fabric (a repurposed thrift tablecloth) to complete the look for only a few dollars. "Pan" and "Shadow" both had foam daggers that we cut and glued. Wooden swords for the "Darling Boys" were made from a couple of pieces of wood lath and hot glue, cost less than a dollar. The hat and hook for "Captain Hook" were both challenging. The hat was constructed from formed chicken wire, topped with paper mache and then covered with fabric. The hook was made by making a form, and heating PVC pipe with a torch to get the general shape. Then we added hot glue to get the final shape and texture of the hook itself. The hand cover is simply the top of a plastic bottle. We attached the hook to the cover with hot glue and used spray paint to finish. We make as much as possible ourselves. The few items we can not make, due to difficulty or time, we hit the costume store for finishing touches. This includes wigs, glasses and some hats. 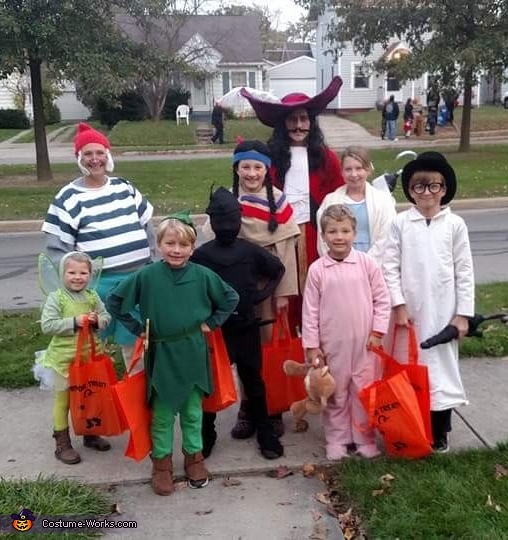 Since this is a family costume, we try to let everyone help in some way. The older kids helped with sewing and prop making, and the smaller kids helped with the paper mache. My wife does the cutting and pattern design and I usually handle the majority of the sewing. Ultimately, we try to be as creative as possible and work together to make something fun for all! This is a family tradition that we have been doing since our oldest was a baby, and it has just continued to get bigger and more fun. We enjoy this time as a family each Halloween. We love the whole process, but in the end, making unforgettable family memories and bringing joy to people is what makes this our favorite holiday. Every year the people in our community look forward to this wonderful family's big Halloween reveal! Their originality and creativity is truly amazing! I always look so forward to seeing your creations, you guys always do such an amazimg job,I love how the whole family get involved and work together. You are such a wonderful family.